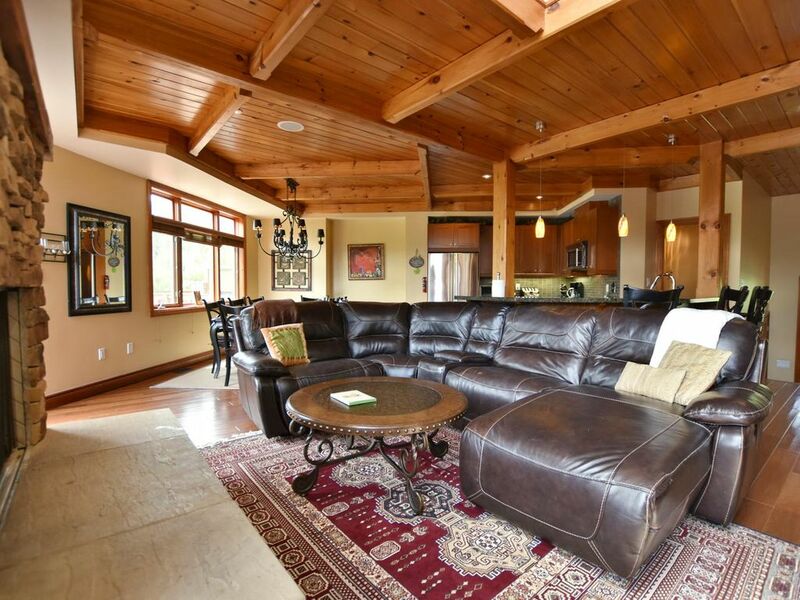 A luxurious, stunning 3 bedroom (can sleep up to 8) french style oak and cedar chalet, 5 minute drive to Blue mountain (intrawest). Amenities are;pool ,10 pers hot-tub(PRIVATE), surround sound system throughout, 55 inch flat screen TVS, fully equipped kitchen with stainless steel appliances,gas barbecue, instant hot , garbarator,dishwasher,full sized washer and dryer,DVD player, phones and much more!! !Two private decks with chairs and tables. All towels and linens supplied. 5 minute drive to the village of Blue Mountain where you can dine, shop or walk around. 10 minute drive to the town of Collingwood. 5 minute walk to the beach.Mountain bikes available for use! Rental applicants must be 25 years of age or older, children are permitted. Fall Special: Couples massage at Living Shore Spa. Valid only on new bookings until 11/30 while quantities last. have been in the vacation rental business for the past 15 years and have many properties around the world. My motto is to make sure that every guest enjoys their vacation and that every need is met. I look forward to speaking with you and ensuring that you have all of the details you need to have an outstanding stay! The property comes as advertised with exceptionally well equipped kitchen. Lots of amenities and ample space. Thank you for your fabulous review . We look forward to you staying with us again . Enjoy the rest of the summer . Pictures do not do justice. Beautiful property inside and out. Tamara was more then helpful throughout our stay. Enjoyed my weekend to the fullest. 5 minutes away to the village of Blue Mountain, great neighborhood. Will definitely recommend to my friends and family. Thank you for your review . I am pleased you enjoyed your stay . Property looked exactly as shown in photos. Tamara the home owner was more then helpful throughout our stay. Perfect getaaway home for a group. Will defiantly be renting again in the near future ! Beautiful home with an amazing view. Couldn't be more perfect. Highly recommend!! When arriving to the Chalet the outside alone was already appealing with a feeling of relaxation. When we walked into the chalet it was better than the pictures as it was so clean, warm and so welcoming. Although it is very spacious, yet it is so cozy. The view of the mountains is breathe taking and hope to see it once again in the winter. It was a great experience and I hope to go back soon. I have already recommended this property to family and friends and invite you to experience it too! Thank you ... Hope to see u again very soon ! We had a great stay at this property. There was plenty of sleeping accommodation for our group. Weather played a bit of a spoil sport and was cool making it difficult for us to get the right balance of heat in the bedrooms at various levels. The lower bedrooms were cold and if we tried to get them warm the upper bedrooms got too hot. But the upside of the cool weather was we were able to enjoy the hot tub in summer. The location and facilities are great with good views of the ski hill. The owner is very accommodating and easy to deal with. Thank you for your comments . Pleased you enjoyed your stay . Hope to have you back very soon . Water slides, skiing, beach, the intrawest village, mountain caves, golfing, fishing,wasaga beach, biking, health spa services, walking paths, hiking trails, horse back riding...and much much more!! !